With Terms of Endearment, Broadcast News, and As Good as it Gets on his resume’, James L. Brooks commands the respect of viewing one of his movies, even if it was not well-reviewed. 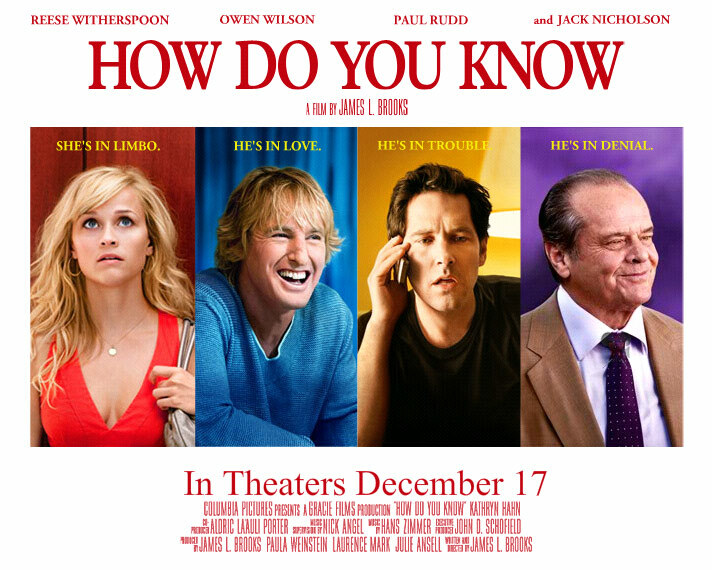 So, I watched How Do You Know, the story of a 31 year old Olympic softballer (Reese Witherspoon) who is cut from the team and thereafter, alternates between two romantic futures – a freewheeling, rich, fun and unserious Major League baseball pitcher (Owen Wilson) and a nervous, polite, endearing corporate-type under federal investigation (Paul Rudd). Rudd’s predicament stems from the wrongdoing of his father (Jack Nicholson) and ultimately, he must choose jail for himself or Dad. The film is fine in parts, and it has its funny moments, almost all of which come from Wilson and Nicholson, but it doesn’t catch hold or intrigue. The chemistry between Wilson and Witherspoon and more acutely, Witherspoon and Rudd, is just not there. Wilson is his daffy, charming self (though as much a baseball pitcher as I am an astronaut), so he’s trying, but Witherspoon is horribly miscast as a jock who doesn’t buy into a future of love. She is not at all jock material, and she seems to know it. Her response is confusion. This is a younger Sandra Bullock role. And Rudd so overplays his mooning infatuation that you soon hope he does not get the girl and, in fact, is jailed. Most times, Rudd’s sweet mug works, but too often in this movie, you just want to smack him in the mouth. There’s also too many cutesy scenes and quirky characters, where everybody has the witty line. The scene in a delivery room (Rudd’s secretary has a baby and gets a marriage proposal from a cookie cutter galoot) is so precious you may retch. Even the relationship between Nicholson and Rudd, which has some pretty good laughs, is too broad and thus unconvincing. There are, however, funny moments and some very good lines even beyond the ones in the trailer. And I’ve certainly seen worse romantic comedies.